Which Boat is Your Church? In San Diego there’s a boat museum with three old submarines tied to the dock. I was visiting the Russian Whisky Class submarine from the 1970s, when I noticed a beautiful sailboat tacking against the wind in the harbor. What’s the difference between these two boats? The sailboat is dealing with wind and current. It is taking risks. The Russian sub is securely fastened to the shore. It is a museum piece. I find that when I talk about the church in the postmodern world, the image of the sailboat resonates with only a few church leaders. Most pastors and lay people would prefer to have their house of worship firmly entrenched in tradition. There isn’t sufficient evangelical passion to send them out into open water. Since the 1980s, the religious undercurrent of American life has turned against weekly worship. This past week, less than 18% of the population was in worship. Further, there is a stiff wind blowing against all forms of institutional-ism and hierarchy. People have embraced the the old Marx brothers’ joke, I wouldn’t want to be a member of any organization that would have me. The gentle, Newtonian, wave theory that supported our traditional church boat is gone. In its place, relativism rules. People go to their social networks with their problems, instead of their pastor. A generation has arisen that does not know organized religion. We can respond to the postmodern world by allowing our churches to become museum pieces. 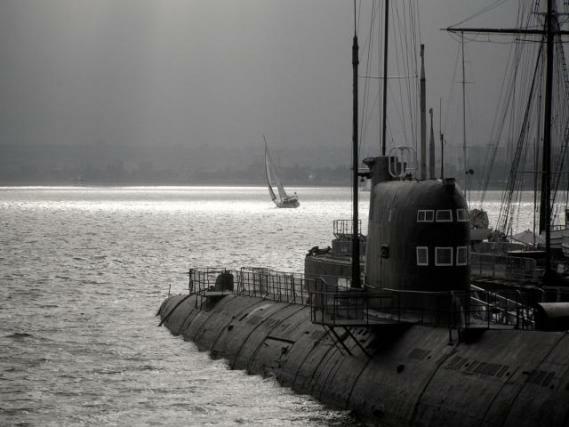 The old submarines in San Diego don’t have to deal with the wind and the waves. They don’t care which way society is going. They say, “Relativism is just wrong.” If you learn to sail, you discover some interesting facts. A modern, sloop rigged, sailboat can sail very close to the wind. In fact, it sails fastest when the wind is against it. A modern sailboat can also survive a terrible storm, as long as it keeps its bow into the wind. There are very few places in this world, that a thirty-foot sailboat can’t reach. It does well on the margins, away from the shipping lines crowded with big institutional boats. Where has Jesus called us to take the gospel? I’m not campaigning to buy a boat. I’m simply pointing out that the reason so few church leaders embrace postmodern ministry is because they have the wrong image of the church in their heads. Jesus commanded his disciples to sail on a night that the wind and the waves would be against them. When they became afraid, he came to where they were, in the midst of the ever changing sea of contemporary society.